Original Shawnigan Lake Cottage with GORGEOUS LAKE VIEWS! One of the last original Shawnigan Lake cottages on Shawnigan Lake! This 70 year old plus cabin has 2 bedrooms (sleeps 1 - 5), that sits on private lot surrounded by stately tall trees nestled at the base of Mt Baldy with incredible views of Shawnigan Lake. It had housed E. J. Hugh's parents while they were care takers for the impressive Shawnigan Lake Lodge. Totally renovated in 2006 and upgraded every year since. It is immaculately maintained. Just a stones throw to the lake and the dock which is shared with the cabin directly in front of this property. Many amenities will make your stay comfortable, relaxing and pleasant. Enjoy swimming, fishing, boating and nature watching (watch for the beaver) from the dock. Relax on the covered porch or open deck. Short walk to licensed restaurant, marina and water equipment rentals. Village is less than 2 km (1.5 miles), offering convenience stores, gas station, pharmacy, restaurants, bakery, cafe, boutiques and more. We are here to help you have a great vacation! A refundable security/damage deposit of 250.00 CAD is due 30 days prior to arrival. 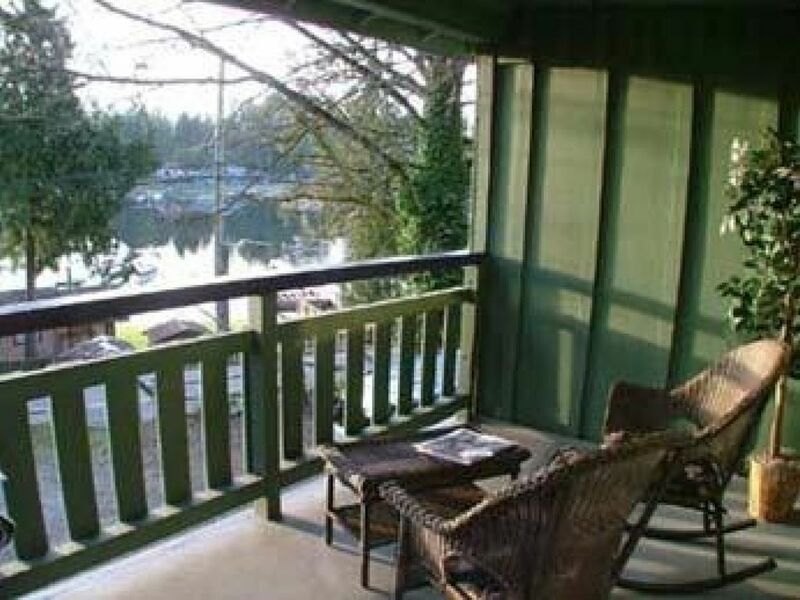 Shawnigan lake is less than a 1 minute walk from the property. The fine sand beach gradient is gradual for a short distance. There is a private dock. Property is not near a ski resort. Owner rents up to 1 crib for 10.00 each per stay. Owner rents up to 1 high chair for 10.00 each per stay. Clean and comfortable cottage. Great location. Having a shared dock was great and would bring my boat next time. May wish to check TV as couldn't get it to work. Overall a great weekend stay. Security or Damage Deposit A refundable security/damage deposit of 250.00 CAD is due 30 days prior to arrival. Pet Policy, Deposit &amp; Fees Pets are not allowed due to bylaws/regulations/policies. NOTE: Persons traveling with and requiring a Service Animal have special rights and must be granted access regardless. Cleaning on Departure A fee is charged for Cleaning on Departure One-time fee of 100.00 CAD for stays of any number of nights or occupants. The guest is expected to clean the BBQ. Extra charges could apply. If property is left in unreasonable condition, extra cleaning fee will apply. Cleaning During Stay Cleaning/Maid service is included in the rent and occurs every 7 days during a stay. Linen Linen is included in the rent Parking Parking is free.